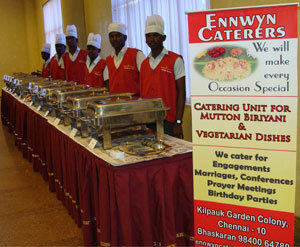 Ennwyn Caterers is one of the leading food serving caterers in chennai city. We are in business since 1995 and have been successfully catering the needs of our clients with outstanding catering services for all their important and special occasions for over 20 years. We feel proud in offering the best satisfied catering services to our customers. With the kind patronage, support and trust we have reached several heights of successes. We offer catering services to all your important meetings and events. It could be marriage functions, birthday parties, corporate event or any other occasions where you get together with your friends, colleagues or family members. We are here to make your meeting and events more special and enjoyable with our variety of mouth- watering dishes. We are specialised in cooking Biriyani than any other in the city. Service and care, quality and style are the most important things in Ennwyn caterers. Currently we are providing outdoor catering services that includes Veg and Non-Veg dishes for Breakfast, Lunch and Dinner for occasions like Engagements, Marriages, Conferences, Birthday Parties, Prayer meetings, Church Functions and special parties like get together at Schools, Colleges, Institutions, Offices etc. Ennwyn caterers is managed by Mr. R.Bhaskaran, who has over 15 years of experience in the catering industry. Under the efficient leadership of the Director, Ennwyn caterers has grown at a phenomenal rate and is on track to grow even more. Mr. R.Bhaskaran provides necessary directions, guidance and support to the management team for catering services with strategic decision for the expansion of the business activities and development. He is a dynamic person, enterprising leader and businessman with a passion for catering and drive for success. 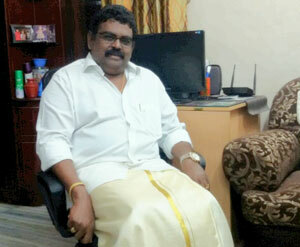 He is also an active member of Lions club and a social activist who wants to offer his help to the society. He manages a highly experienced team capable of providing an outstanding food service for any occasions. With Quality, tasty, hygiene and style as main focus Ennwyn Caterers define ourselves as the best caterers among the competitors with high confidence. Our team consists of well experience and skilled persons who have interest in catering services. Our staffs not just do catering, they love doing it. Every one of us has a passion towards catering. Our staffs will be in uniform, neatly dresses and know how to serve you pleasantly. We maintain professionalism in our service and hygiene is one of our foremost focuses. We understand the interest and capabilities of each of our staffs and have separate team specialised in their own interest. We have people working on different categories like Mutton Biriyani Specialists, Chinese Food Specialists, Vegetarian Specialists, Outdoor catering, Helpers, Drivers etc. We have been offering our service to n number of customers since our establishment. Our clients don’t go for any other catering service for any occasions after they come across us. We are recommended to their friends, relatives and others as the best caterer. We are well known for our quality, quantity, service, taste and style. Ennwyn Caterers is specialized in Mutton and Chicken Biriyani Varieties. We assure our customers 100 % Quality in preparation, 100% Quantity Maintenance, Reasonable in price sincerity, work hygiene, punctuality and reliability. We love doing what we do, that’s why we can able to give an excellent catering service to our clients. You doubt that? To every customer who approaches us with an oscillated mind about our quality and service, we will give you our samples to taste. We have the confidence that we will be appreciated because we provide our service depending on our quality, hygiene and style. We set our own standards in this catering service industry and strive to be the best always. Our association with Ennwyn Caterers is now more than 3 years old. We had chance to know about their service in my Sister-In-Law's son's First Birthday. Then food was just sumptuous and tasty beyond words description. At that time itself we decided to take their service at next available opportunity. And then recently God gave us the opportunity to enjoy their service for our Thanksgiving function. And this being our first direct association with them and again the experience was just memorable. I was just surprise by their professionalism and service cantered approach. Not only that after getting confirmation of our order we had hassle free execution of the order. We are just encouraged to recommend them for all. They have menu to suit all occasions and has no hidden charges for their service. I have no words to express our sincere thanks for all their commitments, teamwork and dedication. we receive the best compliments for the food from all of our invitees. We wish the very best in future. May God enable them to grow manifolds. Please continue to serve the best. Rest God will do. Thank you once again. Through some of my sources, I came to know that you and your team are doing a good job in catering during marriages, anniversaries, parties etc. Since I have taken up the responsibility of arranging food for the guests expected to attend my friend's wedding, I have started to enquire about various caterers who offer both a rare combo of exquisite cuisine and enviable service. That’s when your name cropped up. The food you had served us was excellent and deserving of all compliments. Keep up the good work and the good taste. Every one who tasted your Biriyani said that they have never tasted such a Biriyani with tender mutton ever before. 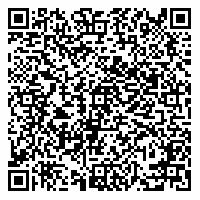 This is just to convey our thanks for the excellent food and other arrangements made by you. Address : # 2, 1st Cross Street, Kilpauk garden colony, Chennai-10, Tamil Nadu. © 2015 Ennwyn Catereers All Rights Reserved.